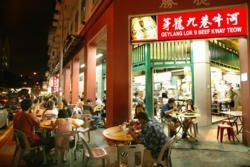 The origin of Katong Laksa is contentious, with at least three stalls claiming to sell the original Katong Laksa. According to a popular local myth, two of the claimants were siblings until they fell out over it, with each fiercely fighting to be known as the innovator. 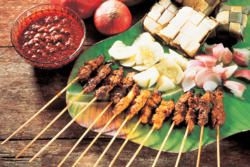 In any case, this is a local delight and a must-try if you are not adverse to rich, spicy food. Laksa is a form of curry noodles, with white noodles replacing the yellow variety. Katong Laksa is usually lighter in colour and the noodles are shorter, so much so that patrons are encouraged to eat the entire dish with a spoon alone, slurping up the delectable broth at the same time. To add to the cholesterol-packed goodness, cockles are usually served together with fish cakes, prawns and beansprouts. The most common type of Bak Chor Mee is served dry with liberal portions of soya sauce, vinegar, chili and lard to enhance the taste. Chai Chee Bak Chor Mee is one of the most famous chains of this local favourite in this variant. Some people prefer the soup version of Bak Chor Mee – specifically, the one offered at Feng Shan Market. It is a dish with noodles, soup, chili and minced pork served up in one small bowl that will have you slurping up every single drop and reaching for the next one. This dish is so popular that, despite a rival stall setting up shop right next to the original, you can still expect to wait for up to an hour to get served during peak time. With that in mind, we advise you to ditch the diet and order two or three in one go! If you have a rudimentary understanding of Malay, you may be confused with this dish as nasi means rice and padang means field (of the footballing kind). In this instance, though, Padang refers to the place in Indonesia. As its name suggests, Nasi Padang is Malay/Indonesian rice served with a variety of dishes. Most Nasi Padang stalls will provide fried chicken, curried chicken, beef rendang and prawns. For those with more adventurous palates, be sure to try cow lungs, known in the local lingo as paru. Ask for a serving of chili unless you are intolerant. You will perspire, pant, guzzle liberal amounts of lime juice but you will still reach for it again and again. This is masochism at its best. This curiously named local dish is a Peranakan (Chinese and Malay fusion) staple. As its name suggests, it is in a shape of a small pie. Actually, it looks more like a muffin, stuffed with a turnip and prawn broth. The ‘pie crust’ is crunchy and once you take a bite, the alluring broth squishes out and fills your mouth with delightful flavours. You can finish it one in two or three bites but each one is a like a little trip to heaven. The secret is in the broth. If made properly, it is sweet, flavourful and yet light enough for you to enjoy dozens without feeling bloated. For the more authentic stalls, they serve with belachan chili, firing up your palate. The first thing that comes to mind when describing local Indian food is Roti Prata, a type of pancake primarily made of flour. Instead of honey or butter, it is commonly served with curry, although some aficionados choose to take it with sugar. Over the years, roti prata has included eggs, onions, mushrooms and even bananas. 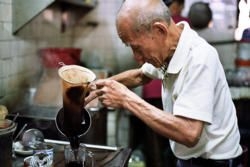 It is a ubiquitous local offering, found in virtually every hawker centre and larger sized coffee shops. Roti Prata stalls are commonly found side by side, which is a testament to their popularity. Yet if you're in a shopping mall and want to have your breakfast like a local, there are two popular chains of restaurants that Singaporeans are particularly fond of: Toast Box and Ya Kun Kaya Toast. We’ll leave you with a final tip: when you are in a local market or coffee shop, take a look at what the locals are eating, or better yet, if there is a queue forming in front of any stall, its a very reliable sign for good food. 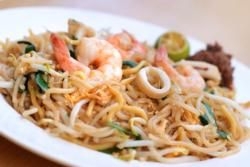 Singaporeans love their food and if it is delicious, odds are there is a crowd waiting for it! Whether you are in Singapore for just a day or longer, we strongly recommend you to taste at least one local meal and suggest you to visit a Hawker Center, one of the places where locals eat most of the time. They can be found everywhere throughout the city. You will also find Food Courts and Coffee Shops in many shopping malls.